By now, you’ve probably become aware that there is an Ebola outbreak, one of the largest, in fact, since the virus was first discovered in 1976, according to the World Health Organization (WHO). One of the best things we can do to help control the spread of the virus is to understand what it is and how it is transmitted. Ebola Virus Disease (EVD) is a severe and often fatal virus transmitted initially from wild animals to humans. It is then spread between humans through direct contact and is not transmitted through the air. There are five known strains of Ebola viruses, however only four have been transmitted to humans. The fifth has only caused illness in animals. Ebola is considered extremely infectious because an extremely small amount can cause illness and even trigger a fatal infection. However, it is also considered only moderately contagious since it is not transmitted through the air like other viruses, such as influenza or the measles, the most contagious viruses. What are symptoms of Ebola? According to the WHO, symptoms may not appear for 2-21 days after becoming infected with the virus and humans are not infectious until they are exhibiting symptoms of Ebola. Symptoms averagely appear 8-10 days after infection. The Ebola virus can only be transmitted when a person is displaying symptoms. Transmission occurs when a person comes in direct contact, through broken skin or mucous membranes, with blood, secretions or bodily fluids of an infected person or animal, or in contact with items contaminated with these fluids. Once a person has the virus, they remain infectious as long as their body fluids and blood contain the virus, which could last up to a few months after recovery. Are there medications or vaccines for Ebola? Currently, according to the Centers for Disease Control and Prevention (CDC), there is no FDA-approved medication or vaccine for the Ebola virus. However two vaccines are currently being tested for human safety, although it’s uncertain when a vaccine may become available. Currently, patients infected with the Ebola virus are treated with IV fluids to maintain proper electrolyte balance, maintaining proper oxygen and blood pressure levels, and treating any symptoms that arise. Contact tracing and isolation are additional steps taken to prevent the spread of the Ebola virus. By pinpointing people an infected person has come in contact with, and monitoring them for 21 days to see if symptoms develop, medical staff can limit exposure of the virus to other people and significantly reduce the chances of the virus continuing to spread. If anyone the infected person has come in contact with does develop symptoms, they can begin treatment immediately. Just one missed contact can continue to spread the outbreak. According to the CDC, patients who have recovered from the Ebola virus develop antibodies that last at least ten years. It is currently uncertain whether those who have recovered remain immune or if they are susceptible to other types of the virus. Additionally, some who have recovered have suffered long-term complications, such as vision and/or joint problems. Where is the Ebola Virus coming from? 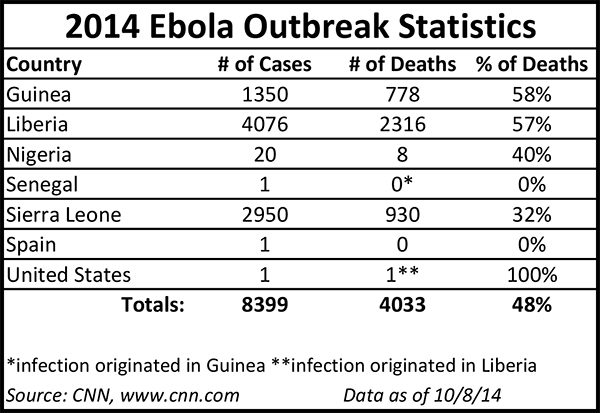 According to the CDC, all non-laboratory cases of illness or death from the Ebola virus have occurred in Africa. The first case of Ebola diagnosed in the United States on September 30, 2014 was in a person who had traveled to Dallas, TX from West Africa. Although he received treatment, he died as a result of the Ebola virus on October 8. Two days after his death, a healthcare worker who had treated him started displaying symptoms of Ebola and tested positive. The healthcare worker has been isolated and is currently being treated for the virus. How can I reduce my risk of becoming infected with the Ebola virus? According to the WHO, avoiding contact with animals and humans infected by or displaying symptoms of or who have died of Ebola are effective ways to significantly reduce the risk of transmission. The CDC suggests avoiding areas with Ebola outbreaks, but if you are unable to, practice careful hygiene, making sure to frequently wash your hands and avoid contact with bodily fluids; avoid contact with infected people and animals; avoid hospitals in West Africa where Ebola patients are being treated; and once returning from an area affected by an Ebola outbreak, carefully monitor your health for 21 days and seek medical treatment immediately if you develop any symptoms. Healthcare workers who may be exposed to people infected with the Ebola virus should wear protective clothing, practice proper sterilization and infection control measures and follow the regulations and policies put forth by the medical facility. Who is most at risk of getting Ebola? According to the WHO, those at a high risk of becoming infected are health workers, family members or anyone caring for someone infected with Ebola, and mourners coming in direct contact with the bodies during burial ceremonies of those who have died of the infection. It is currently unknown whether those with particular health conditions or weakened immune systems are more susceptible to becoming infected. If you have been in contact with someone infected with Ebola or to an Ebola-outbreak area and develop any symptoms, seek medical attention immediately. How many people have been infected with and died from Ebola? 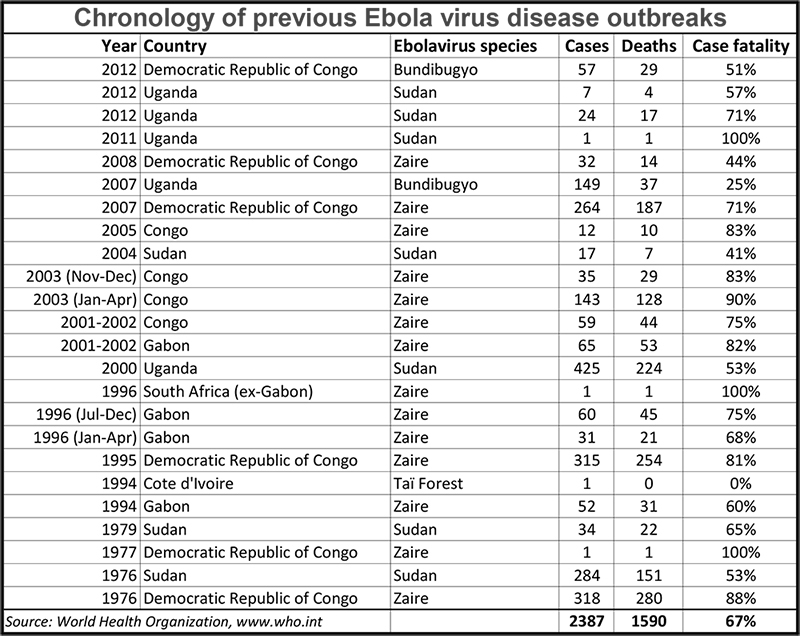 According to the WHO, from 1976 to 2012, there have been 2,387 cases of Ebola and 1,590 deaths (67% total case fatality). During the 2014 Ebola outbreak, according to CNN, there have been 8,399 cases with 4,033 deaths (48% total case fatality). Next Next post: Copy & Paste Not Working on Your iPhone? 4 Easy Steps That Worked for Me!